We got a call from one of our favorite print reps this week. He was knee deep in prepress on a year-end awareness piece Trampoline recently finished for Glens Falls Hospital (pictured above and below), and, like all good print reps, he has sharp eyes. "I think I've spotted a mistake on your Hospital brochure" he said. "Bummer" I sighed. It happens. "It says that they service 3,000 square miles. That can't be right." "Phew. Nope, that's not a mistake." Sweet relief. "Really? 3,000 square miles? That's a big footprint." He's right. That's a lot of ground to cover. Of course, this was the whole idea behind this piece. An opportunity to state clearly all that our hospital has to offer, and celebrate that we live in an area where the latest medical advances are right here—helping to save lives. 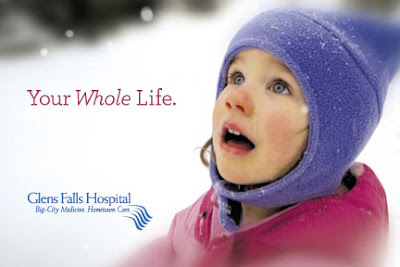 In spite of the fact that the Hospital towers over downtown Glens Falls, many in the community are unaware of all it has to offer, and the number of people who benefit from the services provided and programs offered. We're doing what we can to let folks know. Client to Trampoline: "You'll never Illustrate Textbooks." 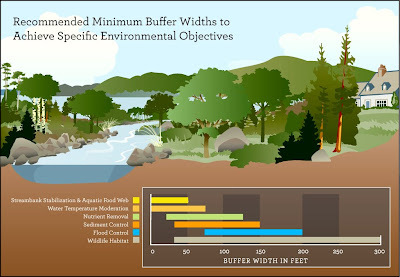 We couldn't seem to cram enough greenery into the above graphic, designed to illustrate how upland development can impact water quality. 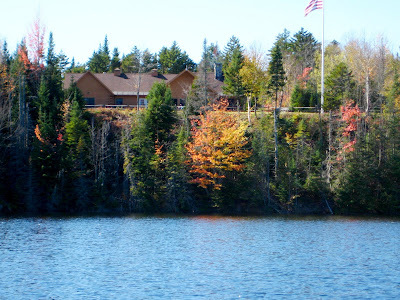 "We need more trees in there" said Peter Bauer, Executive Director of the Fund for Lake George. 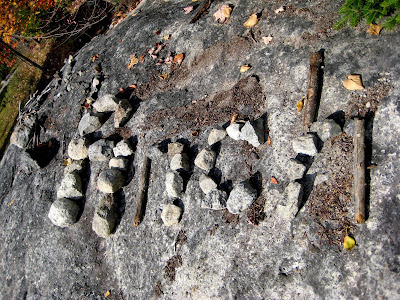 "Rocks, shrubs, bushes—fill it up." "Sure, we can do that" I answered, secretly wondering what constitutes a bush, and how a shrub was any different. Peter was right. As usual. Populating stream banks with trees, undergrowth and boulders helps to filter out harmful nutrients that exist in storm water runoff. Given the choice of categorizing John McCain as a bush or a shrub, I'd definitely say he resembles a Bush. 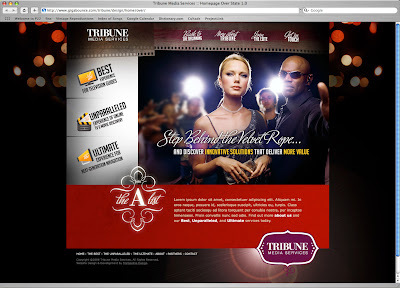 Next up for Tribune Media Services: A redesign of the website dedicated to their A-List suite of products. 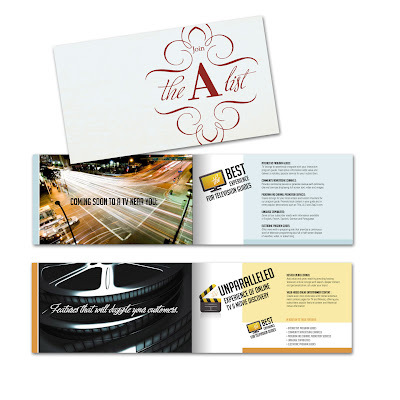 Named and designed by the team at Trampoline, the A-List materials cater to the Cable/Satellite/TelCo segment of the Tribune audience. 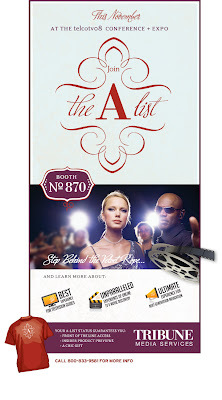 A-Listers include companies like Time Warner Cable, Cablevision, DirecTV, and Comcast. Rest assured, they all have a shirt. 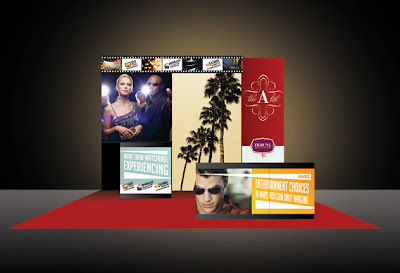 After the site goes live, we'll be developing materials for a Post-New Year's bash at Planet Hollywood in Vegas. Check back for some after-launch linkage. 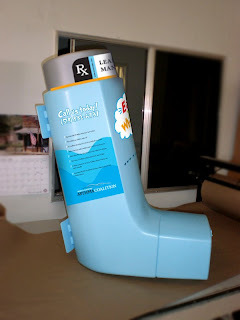 If you live in the Adirondacks of New York State, keep an eye out for giant asthma inhalers that will be on display throughout the region. The North Country Asthma Coalition, a branch of the American Lung Association recently launched an eye-catching and memorable awareness campaign in the North Country, Ease Your Wheeze. The Campaign, consisting of large-scale inhalers mounted in communities throughout Warren, Washington, Franklin, Hamilton and Essex counties, targets school age children and their parents. Each inhaler displays exterior Suess-like artwork and contains informational flyers highlighting the triggers, symptoms and treatments for children with Asthma. Trampoline created the oversize inhalers to bring the issue of asthma to the forefront of the public consciousness. Rather than run billboards and speak to families in conventional ways, we hoped to create something memorable, and exciting. The campaign also includes a series of awareness ads placed in local and regional publications. Each ad takes on a specific asthma-related issue through the use of Suess-icle rhyme and color palettes. For more information about this campaign, contact Marcie Lee of the North Country Asthma Coalition, (518) 832-6937. Congratulations to John, Amy and Luke. Welcome to the world Ellie. 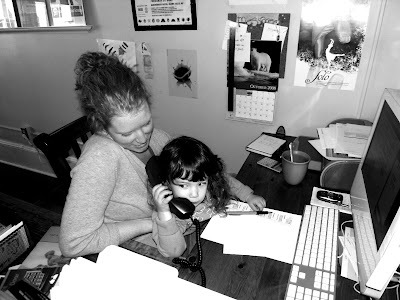 Not sure if it's nepotism or a flagrant disregard for child labor laws. She's a force behind the keys, too. "Twampoline Design, c'nai help you?" It had all the makings of a good suspense film. The believable kind. Some members were old friends, others new to the fold. The sun set on our backs as we looked north into the high peaks. Word came that an important attendee would not be joining us. Disheartened but resolute, we continued off the pavement into untamed wilderness. We had prepared well enough. Creative comps had been mocked up and competitor campaigns studied. Packs balanced, boots oiled and six-packs still sweating. 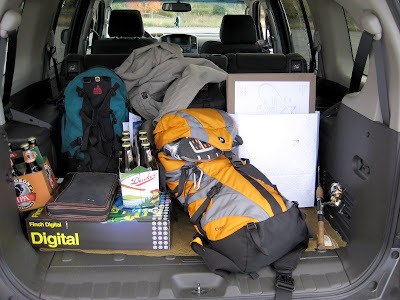 Derek had fishing poles stashed and a Leatherman at the ready. 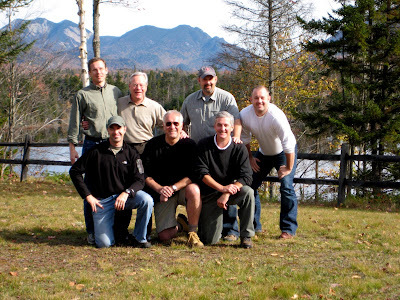 We were traveling deep into the Adirondack Park to a lodge built by the Finch Paper Company. Tony McDowell VP of Sales & Marketing had assembled a team of creative powerhouses from Crosby Associates in Chicago, Doyle Partners in New York and Fort Franklin in Boston. 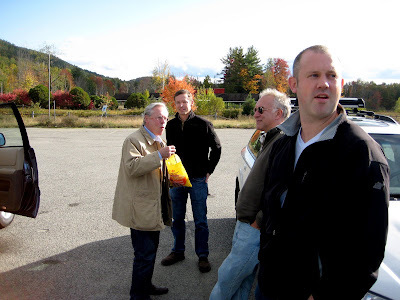 We were all there to help develop a strategy to take Finch into 2009 and beyond, advancing the appeal of Finch's line of uncoated papers—in the midst of the very woods from which the pulp was harvested. We wound our way up through the peaks, through the rusty swing-arm gate that had greeted us at the turnoff. 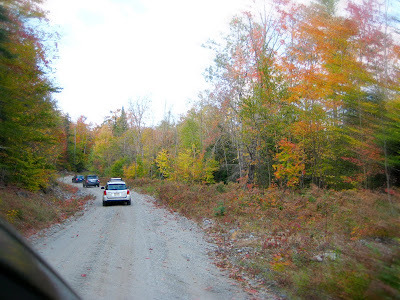 Several miles up a dirt logging road, our caravan pulled off to let an enormous pickup pass, heading in the opposite direction. It was the property's caretaker, called away for an emergency. As the sun sank behind the hills it became clear that we were on our own. Another locked gate blocked our path, and as keys were produced and vehicles crossed through, a chilly October wind shook the leaves from the birches that surrounded us. The swing-arm groaned as it clanged back into place. It sounded like a warning. When we reached the lodge—empty, cold and eerily quiet—we took in the view and set to work, gathering firewood, and starting a dinner of steak and potatoes with sautéed peppers and mushrooms. All this against a backdrop of uneasy Deliverance wisecracks. 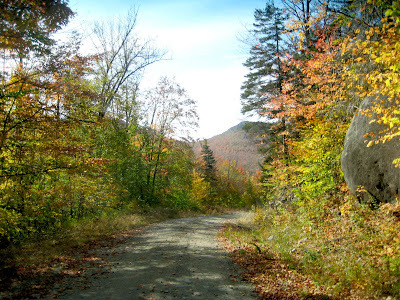 Mount Marcy looked on, the first snow of the season letting us know we were in for a cold night. Yeah, I'm totally dropping the whole horror movie thing. It's way too much work. Cut to the end—the worst thing that happened to our Band of Brothers was leaving the woods to discover that the Dow had dropped 1,000 points. As for the rest of our time at Boreas Lodge, it was a blast. We sat down around a warm hearth, reviewed the past year and charted the next. Derek found a fishing hole (surprised?) and set out to catch himself a story. Four hours later he returned, along with Bart Crosby who had joined him at the brook. They both held their hands about yay apart and looked excited. Without any sort of photographic evidence, the rest of us were skeptical. After all, these were two men that told tales for a living. The Adirondack High Peaks did not disappoint. Nor did the water, with it's glassy reflection of autumn. The Finch Paper retreat was a marvelous place. For the most part, we Design Tramps are from the northeast, the lone exception being Amanda, a pacific northwesterner. It was through Amanda's hometown roots in Yakima, Washington that Trampoline came to work with the Memorial Foundation and, more specifically, the Children's Village. Another piece of this gratifying project is the collaborative exploration of social media as we offer consulting on how best to harness the potential in this arena. The staff of the Memorial Foundation and Children's Village, ever-willing to go the extra mile for their mission, are diving head first into social media, from Twittering and blogging, to Alltop and (soon) Facebook. Accompanying them as they tackle this new frontier with the same passion and intensity as the Village is both an honor and an inspiration.